When analyzing data from chromatography/mass spectrometry, it’s often necessary to identify peaks and/or scans. OpenChrom offers a connector to the well known NIST mass spectral database. But in many cases, specialized databases are used additionally. Most often, *.msl and/or *.msp files are used as a storage container for the specialized databases. A benefit of the *.msl and *.msp format, invented by the NIST, is that mass spectral information is stored in a human readable ASCII text format. OpenChrom offers a connector to use those specialized databases as well. They can be used to identify peaks or scans. First of all, select one or more database that shall be used for the identification of scans and peaks (Menu > Window > Preferences > Chromatography/Spectrometry > Identifier > File Identifier). The preference dialog allows to select mass spectral libraries. Especially when using large libraries, it’s recommended to use the threshold pre-optimization. A value of e.g. 0.1 means that 10% of the ions (m/z) of the unknown mass spectrum must be at least available in the reference mass spectrum so that it will be used for an identification. 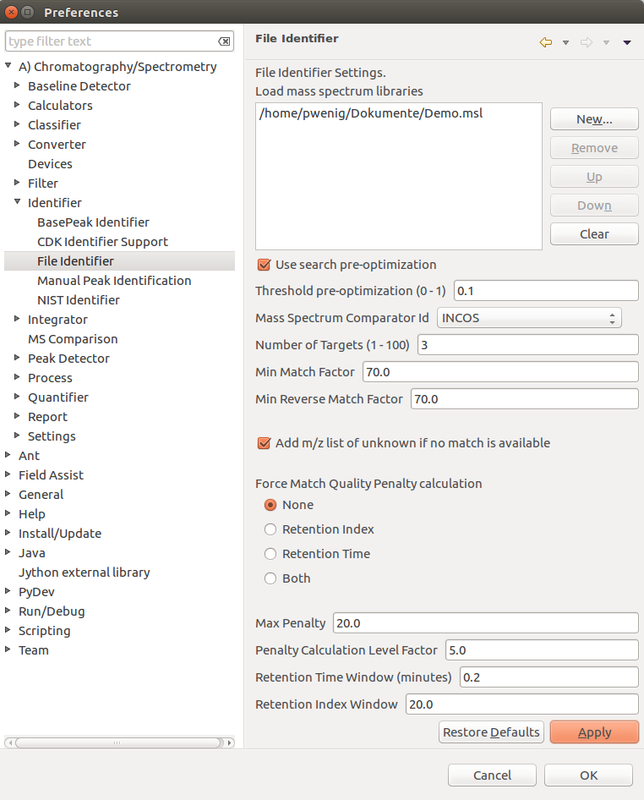 Furthermore, you can select the mass spectrum comparison algorithm, the maximum number of results as well as the minimum match and reverse match factor. If no match was found, the list of highest m/z values can be used instead. Additionally, retention index and time penalties can be used to improve the search results. The identification of scans can be achieved by using the “Pinned Scan Edit (Nominal)” view. Select a scan in the chromatogram editor and run the “File MS Identifier” identification process. All identified scans are marked with a circle. 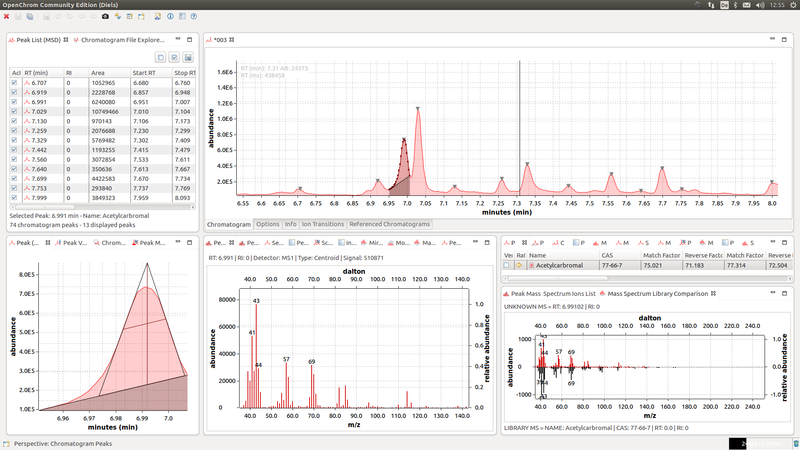 The “Mass Spectra Identified (Targets)” view lists all identified scans of the selected chromatogram range. 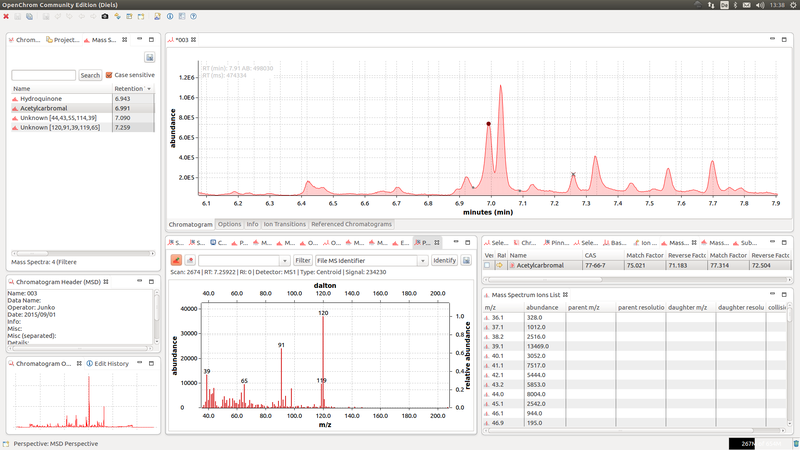 After doing the peak detection, please use the “File Identifier” to identify the selected or all peaks of the visible chromatogram range (Menu > Chromatogram > Identifier > File > Identify Selected Peak). 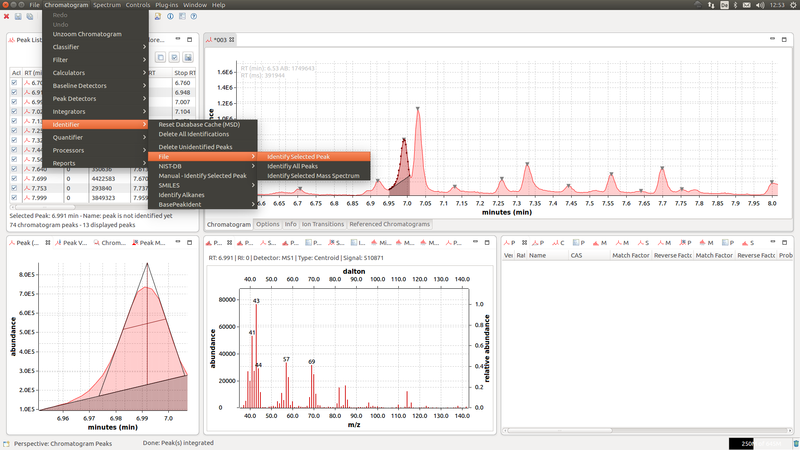 For a better overview, please select the “Peaks Perspective“. When selecting a peak, the “Peak Targets (MSD)” view gets updated which shows the list of identification results. Additionally, you can select the “Mass Spectrum Library Comparison” view to visualize the differences between the unknown and the reference mass spectrum.